The promise of artificial intelligence (AI) is mind boggling. Soon, computers are going to be driving cars through rush-hour traffic, making medical diagnoses, improvising five-star meals—even writing novels. But we’re not there yet. We still have a ways to go before we start firing our personal chefs. Today, AI is primarily used for data analytics, helping businesses derive powerful insights from data before making recommended actions. What customers to target. What suppliers or vendors to partner with. How to ensure compliance. And, as computers get smarter through machine learning, we’ll continue to see businesses automate more processes and continue to take the human element out of more and more decision making. 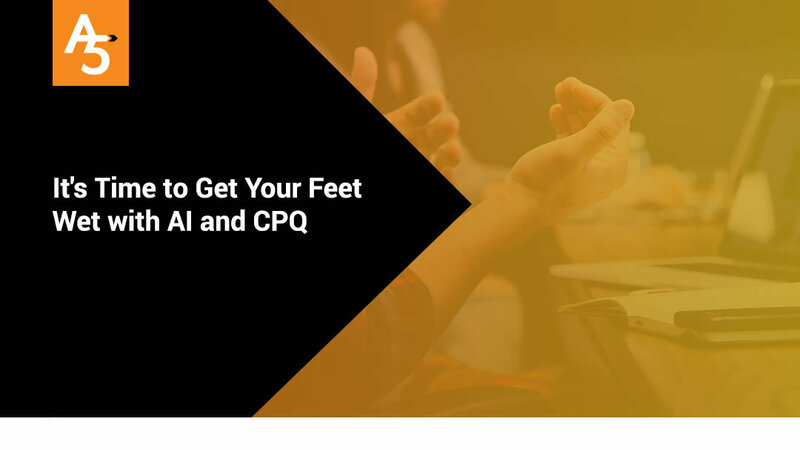 Configure Price Quote (CPQ) software is ripe for testing the AI waters. For one thing, up until now CPQ data has been decentralized across Excel and email and stored in the memories of sales reps and product managers. Just recently have CPQ solutions formalized and centralized this information in a single repository where it can be analyzed. Using this data, AI can look for sales and pricing trends and make recommendations for how to optimize opportunities. Sales managers can validate hunches or disprove them instead of relying on gut feel and instinct, and reps can then be trained and encouraged to push more effective sales strategies using these data-driven insights. For example, many sales professionals think that bigger discounts lead to more sales. Makes sense. The cheaper you price something, the more people are able and want to buy it. However, AI may run the numbers and find out that response time has a much bigger impact on whether a sale gets made. Or it could be bundling other products and services that generates a higher success rate. Rather than cutting prices and losing revenue, the company could decide to focus on streamlining the sales process or creating more upsell opportunities. Full Data Set: There are mountains and mountains of data that need to be collected, stored, archived, secured and analyzed. It’s a tall order. Many business intelligence solutions parse the data to make it more manageable—that is, they manipulate the in some sort of structure, often condensing the data into digestible chunks. Analyzing the full data set is a much more effective data analysis strategy, ensuring you are getting the entire story before creating insights or making conclusions. Make sure your CPQ solutions has access to raw data to ensure you aren’t sending your reps down the wrong rabbit hole. Visualize Trends: Nothing is worse than poring over a spreadsheet and trying to come up with some sort of action. Lines blur, eyes cross, you aren’t exactly sure what you’re looking at. Make sure your CPQ solution has a way to create highly-visual reports that allow you to visualize trends in simple, easy-to-understand graphics. This also allows you to share your insights with other stakeholders within the organization without having to hold their hand while walking them through your data. A quick glance should give everyone a good idea of what the data is saying. This is the power of AI. A good recommendation engine turns insights into actionable information that you can use to change the way your do business for the better. AI can highlight classifications that have the highest correlations and unveil hidden insights. Most importantly, AI allows you to avoid your internal biases and get a truly impartial recommendation. AI is coming to the sales process, and it’s a good idea to start tinkering now to see how you can derive insights into how deals get done and optimize your sales strategy. Just make sure you get a solution that can support some basic AI features. The ability to analyze raw data, create highly-visual graphics and provide recommendations are all critical to deriving the right insights. Come on. The water’s warm. It’s time to dip your toes. Contact the digital transformation experts at A5 today to find out how we can guide your business to greater success.